a few weeks ago, it hit me. that feeling, quick as a bird, that i have lived this before. it was intensely sensory as these things always are – this time touched off by the vivid blue of a dress a roommate had left to dry on the showercurtain rod. in that second i could take in all those things that are normally compressed from moment to moment: the claustrophobic feeling of the narrow shower compartment, the steamy heat of the water, the thick velvety feel of suds in my hands, and the colors – transparent black of the showercurtain, bars of blue and white tile and the dull chrome of the fixtures. so the question: what is it? the truth is that no one knows. the scientific line is that it is an ‘anomaly of memory.’ perhaps your brain is storing information as a memory instantaneously alongside your experience of it. perhaps it is what happens when another, similar memory is suggested but cannot itself be recalled. 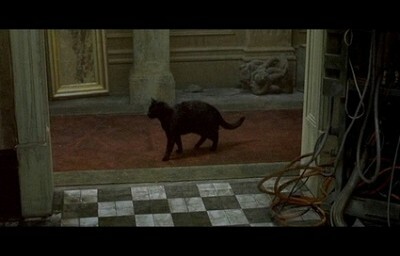 another variant, from the matrix (1999), has a repeating black cat as a sign of a glitch in the system. for a phenomena characterized by the uncanny experience of the expansiveness of time, by the way time seems to be multiple threads twining around us, it’s interesting that these explanations all put deja vu down as something confined to the present moment – your mind confuses memories as you are recalling them in the here and now; the system hicups and in that instant reveals itself to be a system. well, what if deja vu means something closer to the feeling it brings about? because it does feel more important than the conventional explanations allow. so many interpretive avenues open up if you take deja vu as evidence of experience. depending on your perspective, it could be an encouragement to continue on the right path or a horrible warning to stop before you repeat previous mistakes. Definitely an interesting thought. I always find that deja vu happens in a somewhat strange way for me. A lot of the dreams I have are things that I would actually do in real life and they’re so vivid that I often believe that they really happened. For example, when I was really young I thought that I had been to Washington D.C. because I have an extremely vivid memory of walking up the steps to the Lincoln Memorial. And when I visited for what I thought was the second time (I was about 9) I asked my mom if she remembered what we did the last time we were there and she informed me that we had never been there as a family before. As it is, I still have a hard time believing that I wasn’t there as a very young child because of how vivid the memory is. I have dreams like that too! They seem to come in waves for me, like I’ll have several reality-blurring dreams in a week (rendering me a space cadet for the week while I try to continue dream conversations in real life, thoroughly confusing all involved) and then no dreams at all for a week or so. Weird stuff. I have not read that, but I think I’ll have to in my spare time. You know, in between writing, reading feminist theory, figuring out a decent research project, and thinking that Freud is really weird.